Republican Bill Schuette wants to lower the state income tax from 4.25 percent to 3.9 percent, a move he says is necessary to expand the state’s economy and population. Schuette has kept it simple with one overarching pledge: He’d lower the state’s income tax from 4.25 percent to 3.9 percent, where it was before the Great Recession. “Bill feels that Michigan cannot afford to NOT lower taxes because Michigan remains behind not only pre-recession economic levels but behind America's leading economic states,” Schuette spokesman John Sellek told Bridge in an email. As Schuette and Democratic opponent Gretchen Whitmer head into the last weekend before the election, Schuette has kept his focus on taxes and fears of a return to the “lost decade” of the 2000s. Schuette is also promoting other economic plans: he wants to cut the state’s high auto insurance rates, rebuild the state’s roads and infrastructure and improve education, without stating precisely how he would do that while also cutting the revenue Michigan receives from taxes. Schuette, like Whitmer, has proposed eliminating the so-called “pension tax” created as a result of the 2011 tax overhaul signed by Gov. Rick Snyder. The attorney general has, in both debates, on the stump and in his own ads, repeated a common Republican refrain: People do better if they keep more of their money for themselves. As he’s called for lower taxes, Schuette has used Whitmer’s support for the 2007 income tax increase (the state budget was over $1 billion in deficit at the time) as a cudgel against her. If the income tax rate were lowered, the move would save a Michigan worker making $50,000 about $175 a year. Legislators flirted with the idea in 2017 but failed to pass it. Of the eight states with a flat income tax (nine states have none), Michigan’s is lower than all but two (Indiana and Pennsylvania). While lower taxes would be good for workers, it would cost Michigan an estimated $1 billion in taxes annually by 2020. Schuette has not identified how he’d fill that shortfall; $1 billion represents roughly 10 percent of the state’s general fund revenues. When it comes to roads, Schuette has been vague. He’s advocated building better roads that might cost more in the beginning but save money over the long run and said he anticipates getting lower bids for road work with the repeal of the state’s prevailing wage law, which is expected to lower road worker salaries. Al Pscholka, former state budget director and Republican legislator, disputed the savings from prevailing wage because most big projects are federally funded and have to follow federal prevailing wage laws. Schuette said in a recent interview that his road plans would become more clear after he was elected. Schuette has routinely attacked Whitmer for her road plan, which calls for as much as $3 billion in new annual spending, because she has suggested higher fees to generate some of that money ($1 billion, she said, would come from the federal government, though some experts told Bridge that’s wishful thinking.). “Roads are a priority, but to Bill that means we must re-prioritize the funding we currently have first. We have to take a serious, sober look at what our priorities are and go from there,” Sellek told Bridge. 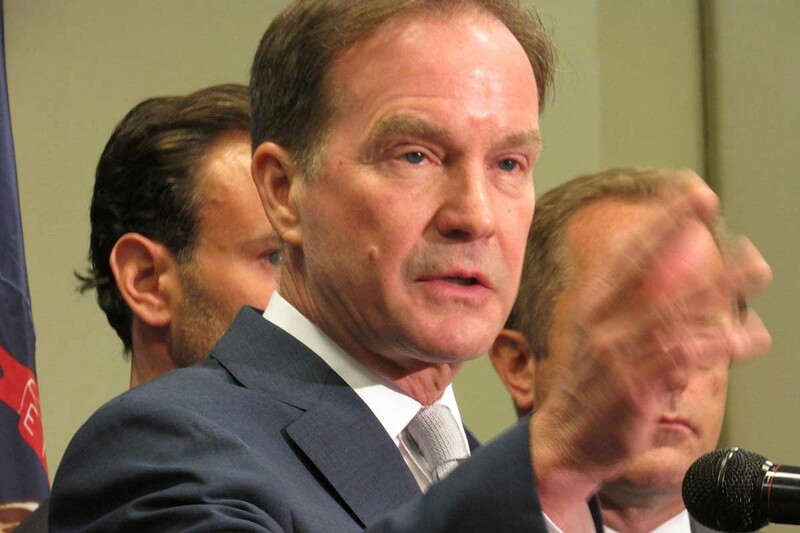 As for auto insurance, a common complaint in much of the state and an acute one in Detroit, Schuette supports Detroit Mayor Mike Duggan’s idea to offer lesser coverage for lower costs. Currently, the state’s no-fault insurance includes unlimited coverage for injuries, a provision no other state has. But Duggan’s plan failed in the state house of representatives in 2017. His office has since filed a lawsuit challenging the state’s no-fault insurance and Schuette said in early October he may support it. Both Whitmer and Schuette have said they want to improve education in the state, from the youngest students through the college-age years. Schuette has pitched putting literacy coaches in every elementary school and pushing for expanded opportunities for skilled trades training. As for increased spending on both, he has said it would come from shifting priorities and working with volunteers. Schuette has also said that he would help businesses by reducing regulations and speeding up permitting. Bridge asked his campaign for examples of both and did not get a response. Its the same old song and dance of cutting taxes to get to an economic paradise. They never learn that it doesn't work. But it was so successful in Kansas! 'A shot of adrenaline to the heart of the economy' the GOP Governor said. Kansas's economy went into shock and died after that. There are any number of reasons to discuss the appropriate income tax rate, but economic growth isn't one of them. Tax cuts in states that require balanced budgets don't have the multiplier effects often associated with federal tax cuts because any additional ability to spend on the part of consumers is offset by an equal inability to spend by the state. It may promote smaller government, but no additional economic activity is created by merely shifting who does the spending. In addition, a rate reduction to 3.9% would reduce state revenues by about $1.3 billion, which sounds like a really big number. However, Michigan's GDP in 2017 was just shy of $505 billion, so a rate cut to 3.9% is only 0.2% of Michigan's GDP. Stated differently, it's less than one day's worth of economic activity in Michigan, so expecting a large tax cut to stimulate economic growth just isn't reasonable. To reiterate what I said at the beginning, I'm not saying there aren't reasons to cut taxes, and that's a discussion that should take place. However, cutting taxes for the purpose of generating economic isn't one of them. Kansas destroyed itself with this same sort of tax cut nonsense. That was less than a decade ago. Why do people keep buying this trickle down garbage, when we have 40 years worth of evidence that the most it accomplishes is degrading services for the poor while putting cash in the pockets of the 1%? On the other hand, Bones, you can say the same thing about Connecticut, a very wealthy and high tax state with even worse economic growth than did Kansas, (Kansas along with all most all the big Ag and resource states had poor growth). Further what you refer to as trickle down economics can also be interpreted as a business focused government, which is why the stock market rallied with Trumps election and Michigan business took off right after Granholm left office. Face it, job creating businesses generally don't like operating under leftist governments. Note to Bill S. from long-time Michigan resident and taxpayer: we're not in Kansas any more and moreover, I personally never want Michigan to be anything like Kansas. But if that's what you want, why don't you move there. Maybe the Koch brothers have a spare room for you in Wichita. I don't doubt that you already have some of their money.